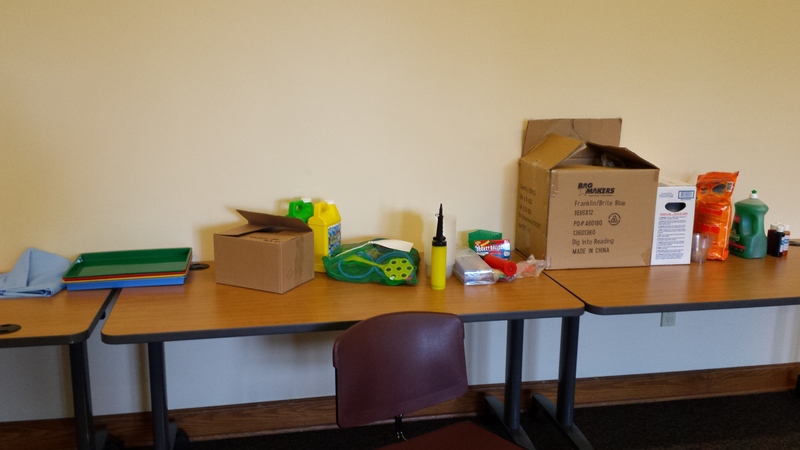 In the past I’ve held STEM programs for preschoolers but these programs can easily be modified for all ages. I decided to go for it over the summer. 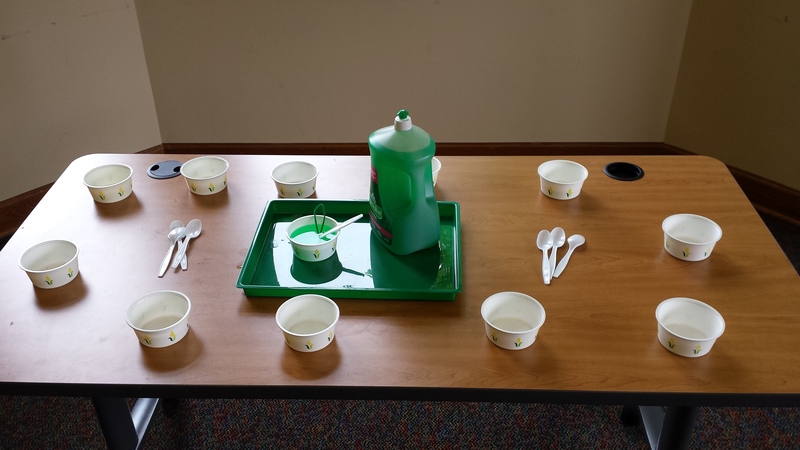 I planned 3 programs-1 Slime and Goo and 2 Fizz, Boom, Pop (one in each of the two branches I do programs in). This one is Fizz Boom Pop. 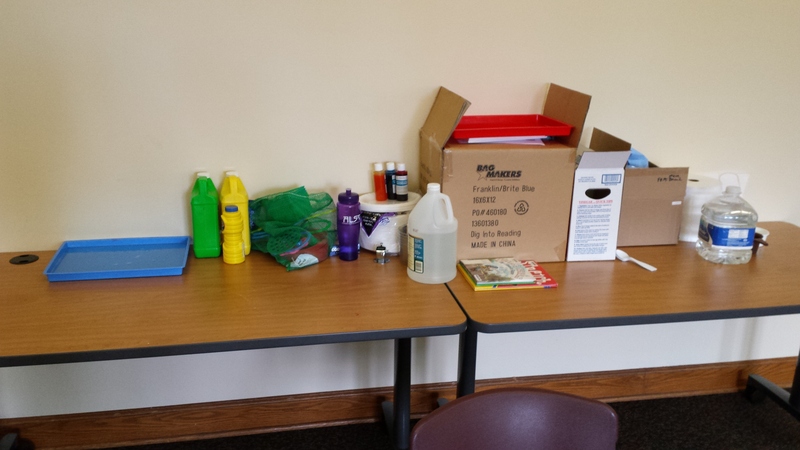 There are kind of a lot of supplies involved, but the good news is they’re cheap supplies. And, of course, books to check out AND recipes to take home (I truly do not know I am sometimes unable to take a clear picture). I read Bubble Bubble by Mercer Mayer in one program and Stretch by Doreen Cronin in the other (younger kids in the second program). Plates with drops of liquid watercolor covered up with baking soda. Eye droppers and cups of vinegar. 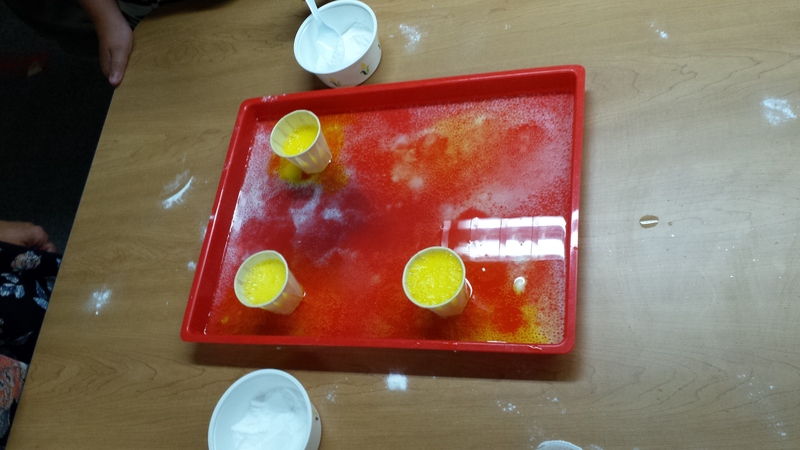 Kids use fine motor skills squeezing the vinegar out of the cups and onto the baking soda plates. 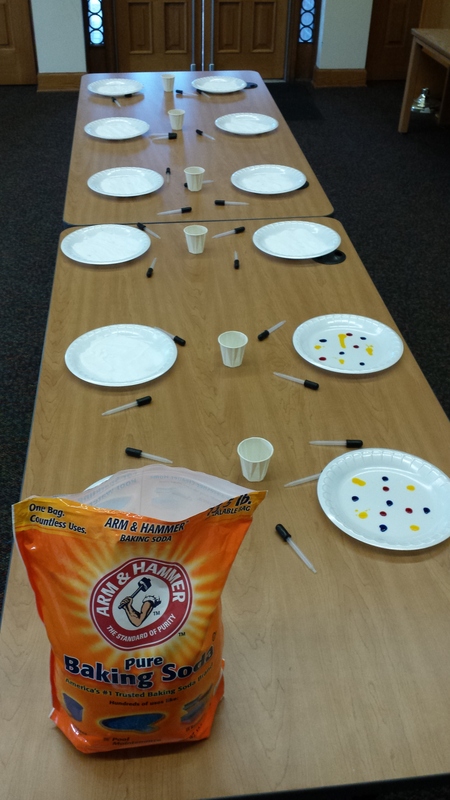 They get a fizzy reaction and as the baking soda gets soggier, the colors mix and we can start guessing which colors were originally under the soda. There are always a few who get it right and a few who see purple and think purple was under the soda-this gets to be a magic learning moment for those kids. They really think its magic that there was blue and red and together they made purple. In one session we did mini explosions together after they had exhausted the fizzy trays because there were 150 in that session. In the second session it was a station all by itself. I knew the attendance would be smaller at the second location. Cups about half full of vinegar, scoop a tablespoon of baking soda into the cup and watch it explode. Add some color for extra fun. This one I only did at the first location because it works pretty well with a large group. 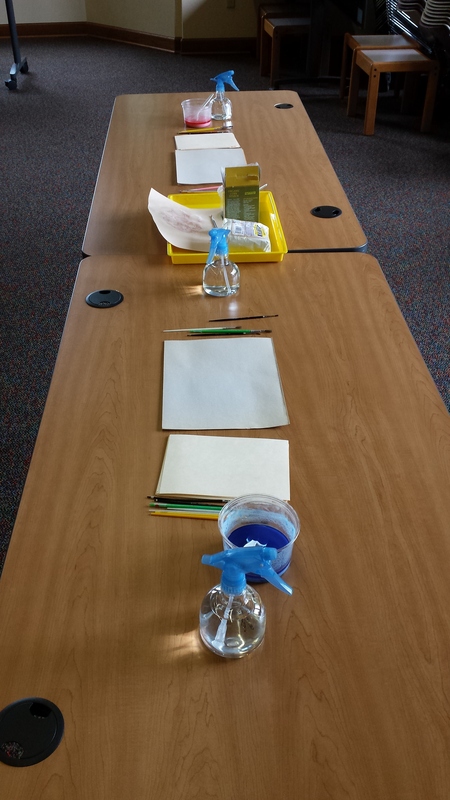 They could all share the fizzy paint that we made together and can share the spray bottles filled with vinegar. 2 heaping teaspoons of baking soda, 1 heaping teaspoon of corn starch, some liquid watercolor, add liquid until it’s the right consistency. Kids paint with it and after they are finished with their picture, spritz the painting lightly with vinegar and it will fizz! 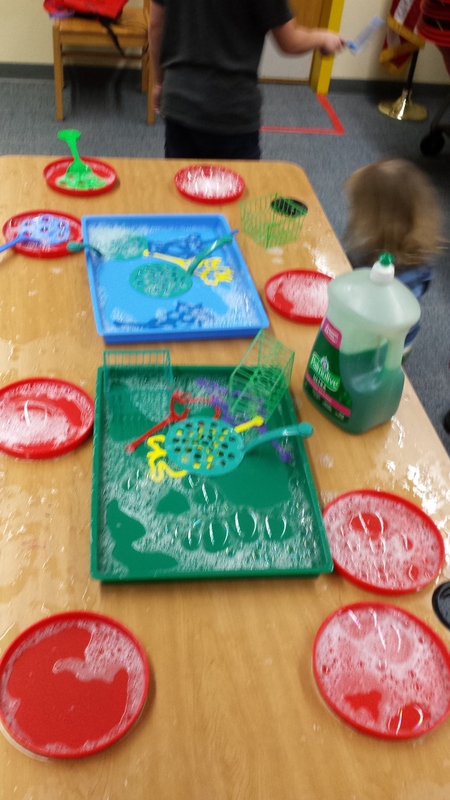 In the first session each kid (really each family) made a tub of bubbles with dish soap and water. 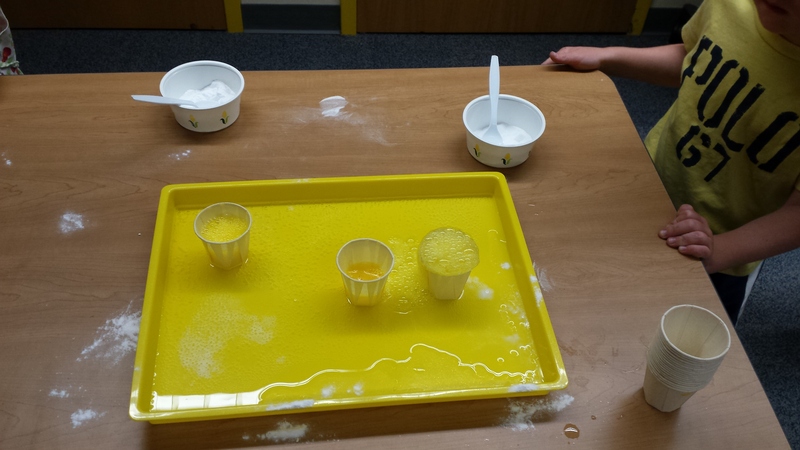 They were encourage to guess how many teaspoons of soap would be required for the best bubbles. After they had the consistency they wanted, they got to play. 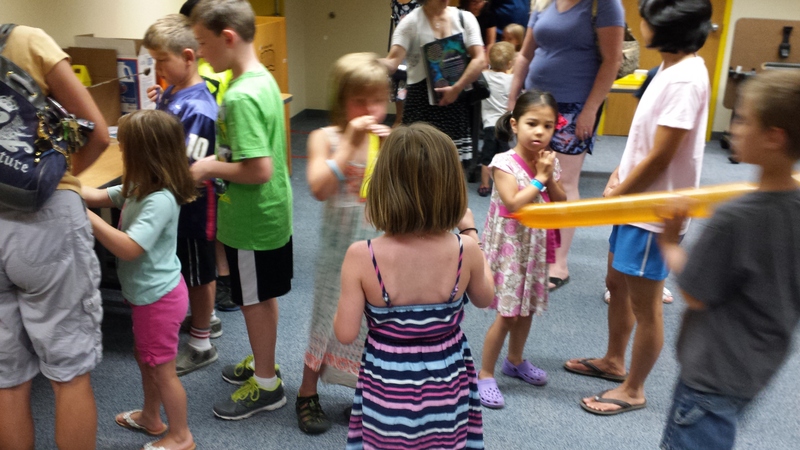 They also got to make their own bubble wands out of pipe cleaners. 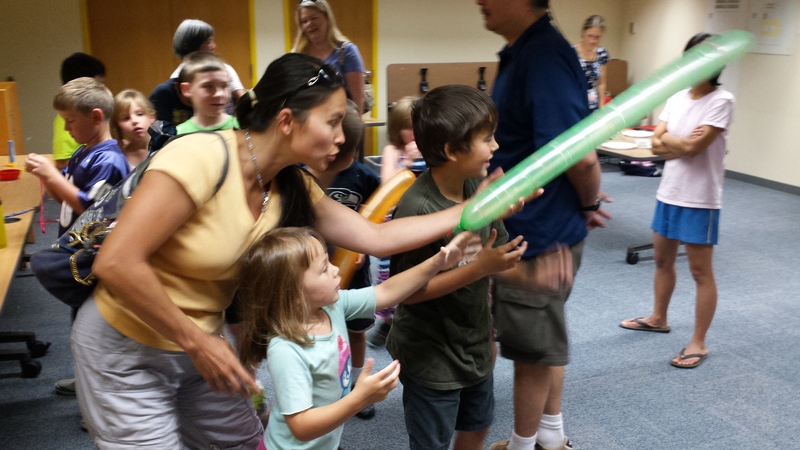 The second group didn’t make wands because the room was much too small for an additional station, but they DID get to play with the cool, Steve Spangler bubbles, which I feel totally made up for the lack of wand making. This one came out in the second session and was by far the most popular activity, which is why I’m super glad I didn’t pull them out until AFTER they had started cycling through the other stations. These come from Steve Spangler. The noise is incredible, especially when they pop, which many will. But, hey, science. What will happen if I put even more air into this balloon that looks pretty full already? Hi- I didn’t use specific books as tie-ins. 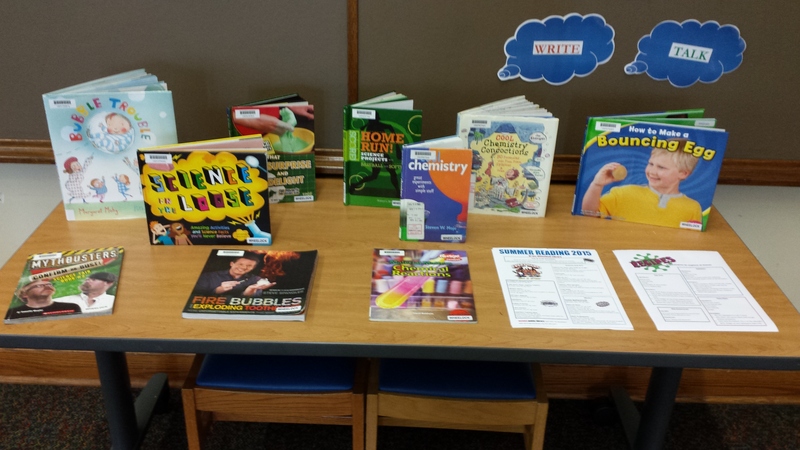 I just placed books related to chemistry, science experiments, etc. on display. I did read Bubble, Bubble by Mercer Mayer and Stretch by Doreen Cronin in 2 of the programs. Hope that helps!